I have today received, from Cory Defoe (Dalston Town Centre Manager), images of 7 potential replacements for the 3 pieces that were recently removed from the square’s play area. Cory, as previously promised, would like to hear the opinions of residents as to which 3 pieces we feel would be the most suitable replacements. To see the choices head over to our forum and the thread I have created for this very purpose HERE. It would be most helpful if you could leave your selections and opinions at the forum (so they are all in one place), but if you do not have the time to register, a very simple 2 minute procedure (although anyone can read the threads, registration is required to reply to them), feel free to go ahead and leave your response here on the website (if you are reading this as an email simply reply to the email, or, if you are reading this on the website itself, click the ‘Comments’ link immediately below this post). Cory is looking to get things rolling asap so please get your opinion up as soon as you can: If Cory gets no responses, he will have to go ahead and make the decision himself. Just one thing to bear in mind: What we are looking for is equipment that appeals to young kids, but NOT to late-night revellers (who may decide to detour via the square on the weekends after turning out of the clubs for some late-night amusements at the expense of our sleep), so take that in to consideration when making your choice. For many months now Ben Collins, DSRA Chair, has been working on the issue of phase I restaurant odours working their way up in to the residential areas of most of the phase I blocks. He has attended multiple meetings with Barratt Homes, Consort Property Management, and various different departments of Hackney Council, as well as writing umpteen emails and making many phone calls. Progress is slow, but there is progress and Ben has written us a report on just how things are going. Before that though, a little background: The problem, for those unaware of the whats and whys, is that it was not originally envisaged that all of the commercial units would become eating establishments and so no proper kitchen extraction system was put in place during construction. The system that has been retro-fitted is therefore totally unsuitable for purpose: Rather than an extraction system that vents odours above roof level (the correct way of doing it), all of the restaurants simply pump their kitchen odours in to the communal service tunnel that runs the full length of phase I. From there those odours are finding their way in to lobbies, lift shafts, up to even the highest floors, and when wind conditions are just right, in to people’s apartments. Clearly this is not acceptable, hence Ben’s work to find a solution. The Dalston Square Residents’ Association is aware of the frustratingly slow progress on reducing the restaurant kitchen odours that pervade our buildings and flats. We are chasing Barratt Homes to install proper extraction units in the building. The DSRA will continue to take this issue seriously and is in constant touch with our councillors and Hackney Council Pollution Unit. The good news is that Ms Jackson, officer at Hackney Council’s Pollution Unit is taking this matter seriously, and has been pursuing both Barratt Homes and the Council’s planning department (who need to agree whatever alterations to extractions systems are needed) to resolve the issue. We are told that Barratt Homes are due to submit plans for an improved extraction unit to the council’s planning department in the near future. The Pollution Department has received many emails of complaint from residents. These emails have helped that department impress upon Barratt Homesthat there is serious concern and the matter must be addressed. The bad news is that ‘patience’ is the name of the game. The wheels of both Barratt’s engineers and the Council’s planning department work slowly. We could be looking at months rather than weeks to see any action on this issue. However the DSRA and the Council’s Pollution Unit are on the case and will keep you updated on progress over the coming weeks and months. Of course this does not mean that a resolution on odours is guaranteed. Pressure from residents will ensure the matter is kept alive (and the more residents the better), and you are encouraged to continue to report any high levels of restaurant kitchen odours that cause you concern, to Barratt Homes customer service department (online complaint form/020 8522 5500), as well as the council’s Pollution Unit (pollutionsupport@hackney.gov.uk/020 8356 4455). That’s that then: We will keep you posted on progress via this website. While I have your attention, just a couple of reminders on upcoming events. Firstly, the Crossrail2 public consultation meetings are next week (see the post over at our forum HERE for more details). It is in every Dalston resident’s interest to try to win the route over Hackney Central so your support is greatly needed. 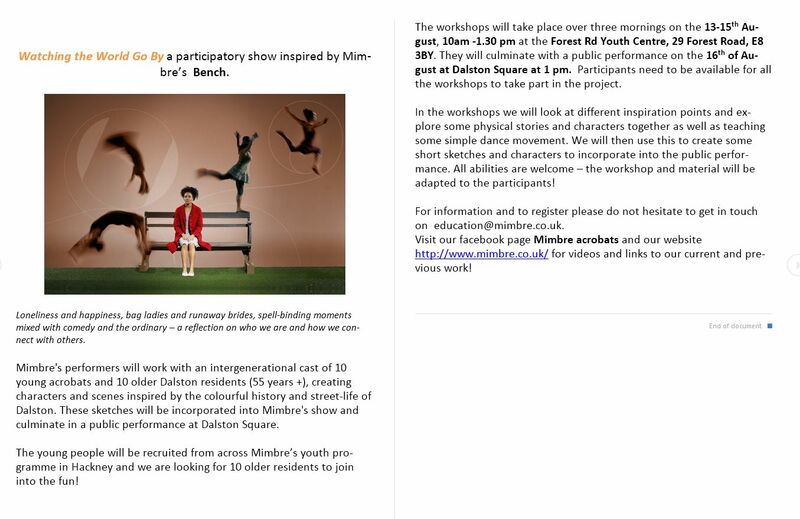 Secondly, this coming Saturday (July 12th) sees the next public event in the square. ‘A Hackney Motley’ is an event that kick-starts what the council are calling ‘Hackney Archive Residency’. If you have an interest in local history this is a must. More info can be found HERE. Lastly, while the council lays on these public events completely free of charge, they have put out a call for volunteers to assist in prepping the Square for them when needed (erecting the purpose made tent/canopy, a 3 man job, for instance). My previous call for volunteers resulted in not one single volunteer. Come on neighbours, surely we can do better than that! Contact me at dalstonsquarera@gmail.com if you can spare an occasional half hour on a Saturday, and I will pass your details on to the council as possibly being able to help (no-one is expected to be available every time). Thanks in advance. There are a few things to cover in this post so if one topic is not of interest to you, please scroll through to the next paragraph. As many of you are all too aware, the long awaited opening of the children’s playground here in the square has turned into a nightmare for many. After months of local kids having to gaze longing at the playground through wire fencing, the handover of the completed public square from Barratt Homes to the council (the only ones with the necessary public liability insurance that would allow usage of the playground) happened with little fanfare. And as those kids finally got to play on the award winning sensory-play apparatus, so the residents whose flats overlook them discovered what that meant for them: Continuous whistles and chimes at volumes that were, quite simply, extremely annoying. And not just during the day: Weekends especially have seen the noise continuing throughout the night as local clubbers and party-goers passing through the square late at night/early in the morning, find it amusing to see just how much noise they can make (maybe in their eyes some believe they are making music?). Needless to say there has been much dismay and I understand the council (both the Dalston area manager that is in charge of the square and it’s amenities, and the noise complaint team) have been bombarded with emails from disgruntled residents. Due to the usual “procedures” and red-tape, progress in addressing this issue has not been as swift as some would of liked (which I must mention is no excuse for the rudeness contained in some of the emails the council have received), but town-centre manager Cory Defoe has been on the case on behalf of residents and this morning he told me relief is high: With a little luck and a tail-wind, the 3 ‘musical’ devices (the tall, hand-pumped whistle, the whistling pedals, and the metal chime plates) will be removed before this weekend (should that not happen they will go early next week). The holes this creates will be made temporarily safe while the council consults with local parents with regard what to install as replacements. The whole process, which involves planning permission (which Cory will attempt to speed along with a retrospective application), ordering of the desired replacements (which are generally made to order), and of course installation, could take some weeks, but things will move along as quickly as possible. The original apparatus was a poor decision, but rectifying that has become a priority: Just a little more patience please. I have myself also spoken to Gerald Bernard this morning, who has agreed to instruct his night concierge team to try to reason with late night ‘musicians’. No guarantees here though as they have no jurisdiction over the council’s square, but they will try. Anyone interested in hearing the opinions of some of those affected can visit the thread that has been running in our discussions forum since the day after the playground opened, HERE. Slight change of subject now, going back to the above mentioned handover with little fanfare. 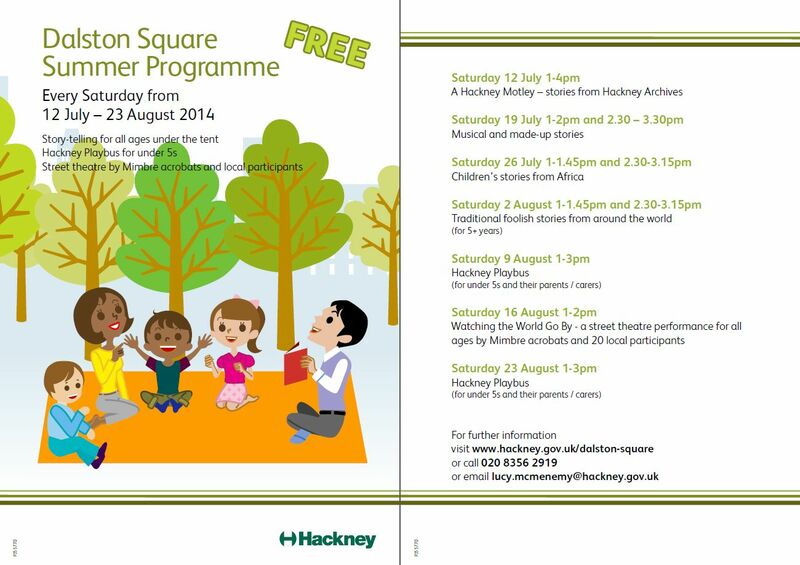 There will be an official opening of Dalston Square to the public by Hackney Council: And all residents are invited (keep your eyes peeled for invites). What exactly is happening, and when, is as yet still unknown but more details will be revealed ‘Soon’ we are told – Watch this space. 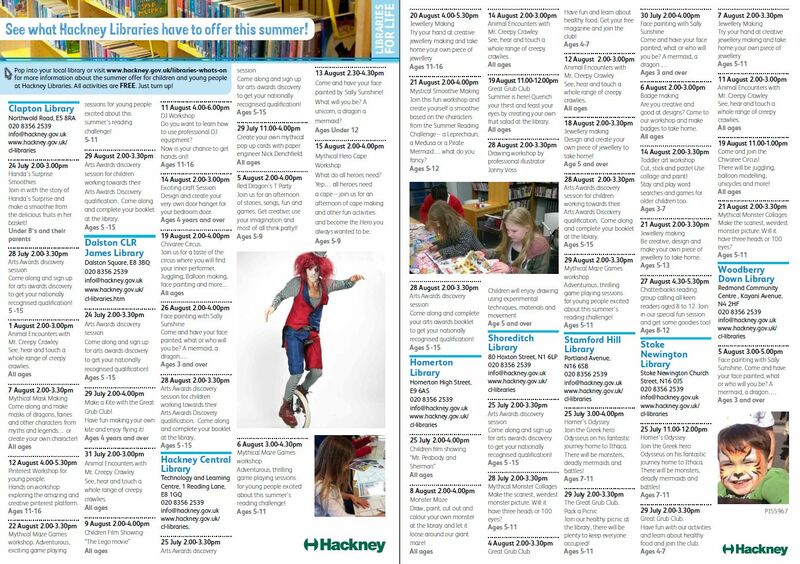 Next, is there anyone out there interested in buying an ad, or advertorial, in a print run of 50,000 copies of a free pocket guide to Hackney? The project is being run by “…a freelance travel writer working for Lonely Planet and Rough Guides…” who also “… wrote the East Hackney Cookbook, which is raising £10,000 for 2 local food charities.” If yes, check out Helena Smith’s website HERE (you can also contact her through that website). The last topic of this posting is “Hyperfast broadband”. Do you remember THIS post I made back in May of 2012 about 1Gig internet download speeds coming to Dalston Square (and the topic’s accompanying forum thread HERE)? The same company, Hyperoptic, after being given permission by Barratt to work on one of their other developments, has given Hyperoptic the go-ahead to survey the rest of Dalston Square (phases I & II were surveyed last year to get it started) with an eye to granting them license to ‘wire us up’. First Openreach (BT’s infrastructure arm) would be contracted to run fibre from the street into block basements, where the exchange boxes will be placed. Each and every block would then receive a new copper network that any resident can be hooked up to if they wish to pay Hyperoptic a monthly fee (as with any other ISP of course). Connection to these phenomenal speeds requires that you have a modem in the cupboard by your front door. Anyhow, to pre-register for the service and receive a discounted price for the first two years, visit their website. These are not unreasonable prices for speeds like this, and no connection fees which is cool. They seem to be investing quite heavily in the hope of acquiring customers, but could do well as the first to offer the service. BT doing this themselves is looking as distant as ever (we were told back in 2012 that their paltry 60Mb ‘Infinity’ service was only 6 months away, but it has been continually delayed ever since).